Not every part of planning your wedding has to be stressful. At Phoenix Charter Bus Company, we take the stress out of all your transportation needs. With access to over 3,000 buses, 24/7 customer service, and experience working with hundreds of couples, we’ll match you with the perfect transportation option for your engagement party, bridal shower, bachelor or bachelorette party, and your wedding day. Ready to start your booking process? We’re available 24/7 at 480-445-9823​ to talk about your big day! Oftentimes, expensive fare, long distances, traffic, and unfamiliar streets may leave guests lost and stressed, which can lead to late arrivals. Stop worrying about your guests’ experience with a personal shuttle. We’ll ensure your guests won’t have to worry about traffic, parking, and navigation so they can focus on celebrating your new union. Whether your guests are coming from out-of-town or down the street, we’ll make sure they arrive on time and ready to focus on the festivities. We’ll shuttle guests from the Sky Harbor International Airport to their hotel, from their hotel to your venue, or anywhere else they need to go. Who wants to worry about transportation on the day of their wedding? You don’t! Instead, let Phoenix Charter Bus Company do it for you. Your professional driver will arrive 15 minutes before your departure time and find the most efficient route to your venue so you can savor those intimate moments before and after your ceremony with your closest friends. Let us handle all the transportation logistics to and from your venue so you can focus on your wedding day. Don’t limit your wedding transportation plans to just your wedding day! In the past, we’ve provided reliable and speedy service for all kinds of wedding events in Phoenix, from wedding showers to rehearsal dinners and anything in between. Coordinating a night on the town for the lucky bachelor or bachelorette? You can rely on Phoenix Charter Bus Company for a shuttle through Phoenix’s lively nightlife and to make sure everyone has a safe ride home. We’ll pair your group of merrymakers with 20-passenger minibus to traverse downtown Phoenix in a flash. Looking to transport your entire wedding party out-of-town for a dinner in a nearby city? The 56-passenger charter buses in our network will provide a comfortable and relaxing ride for your guests, no matter the distance. While your friends, family, and loved ones will be focused on celebrating your special day, it never hurts to upgrade your private transportation with small details that can enhance your guests’ experience. With luxury amenities like reclining seats, extra legroom, WiFi, and power outlets, your guests will arrive at the venue, party, or ceremony in style and comfort. We can even assemble a fleet of all-black or all-white motorcoaches to compliment the style and theme of your wedding! Your wedding day should be full of celebration, not stress. 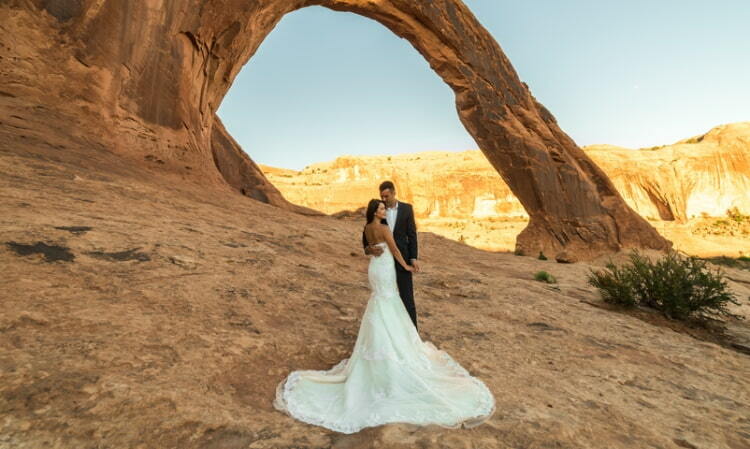 Phoenix Charter Bus Company strives to make your wedding a complete fairytale, and that starts with stress-free transportation. Want to learn more? Call us any time at 480-445-9823​ to speak to a reservation specialist. We’re available around the clock, and we’d be happy to walk your through the available bus options, amenity packages, and prices.